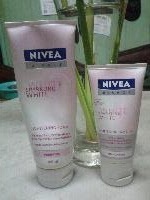 This time I'd like to share to you about my experience using these two products fron Nivea; Nivea Visage Sparkling White Whitening Foam and Whitening Day Care. This foam is formulated specially for Asian women's skin. It contains White Pure Actives to help brightens up the skin and White Crystallites to create more radiance to your bright skin. It cleans your skin without removing natural moisture from your skin. I've been using this for around 2 weeks and I love this foam! It doesn't leave my skin tightened up after washing my face. The fragrance is soft and nice too. For the brightening effect, well it somehow brightens up my complexion, though it's not that significant. For a consumer product, this foam left me impressed as it does its job great. This cream works on the skin surface and deeper layer to help brighten up your complexion. 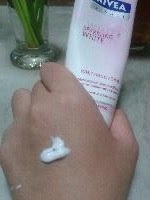 It contains the combination of White Crystallites and White Pure Actives to brighten up the skin. Moreover it also contains Carnitine to help preventing the excess production of oil and UVA/UVB to protect our skin from the bad of sun light. 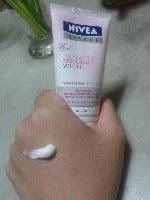 I always use this right after washing my face with Nivea Visage Sparkling White Whitening Foam. The texture is between runny and creamy. The fragrance is too much for me. FYI, I have a very sensitive nose, so I prefer mild, soft-scented products. It will be better if the product is fragrance-free. But for those of you who have no problem with fragrance, I guess it will be okay. 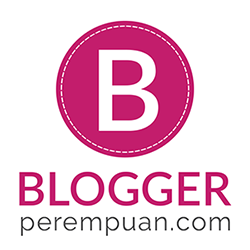 Move on to the result. It gives me matte- finish which I have love-hate relationship towards it. On some occassions, the matte-finish looks great while others making me dull. Talking about the UV protection claim, I suggest those who use this cream to wear sunscreen/ sunblock afterwards. This is because his product doesn't state any amount of SPF/PA on its product. So the level of protection might not be sufficient to protect our skin from the bad of sun light, especially judging from our lovely climate. Afer all, Indonesia is a tropical country with sun shine all year long. So don't forget to add sunscreen/ sunblock right after if you decide to use this day cream. Both products don't cause me any breakouts nor any trouble to my skin (redness, itchiness, dry), so I am confidently saying thay these two products from Sparkling White line are recommended! nice! btw are teh winners announced for the wishtrend giveaway? Open Invitation: Za Beauty Show!